In 2008, and following a controversial election in which long-running President Robert Mugabe was re-elected to lead Zimbabwe, both government and opposition meet to draft a new and democratic constitution for the country. The process is depicted through the eyes of two men on opposite ends of the political spectrum, both of whom have been appointed to key positions in the constitution-drafting process. Paul Mangwana is a confident and affable representative of President Mugabe’s ruling ZANU-PF party. Douglas Mwonzora, by contrast, is a more cautious and serious man. A lawyer working within Morgan Tsvangarai’s Movement for Democratic Change, he knows the illegal lengths to which his opponents will go to subvert democratic process yet by necessity must work towards positive change within the corrupted system Zimbabwe has available. It is a difficult and fraught process, with both parties undertaking an enormous number of joint town hall meetings across the country. It is soon apparent that representatives of the ZANU-PF are intimidating locals ahead of the meetings, and anybody bold enough to speak out against sitting government policy are likely to find themselves at the wrong end of a police baton shortly thereafter. Once the meetings reach the capital Harare, busloads of pro-Mugabe voters from rural areas begin appearing in growing numbers in attempt to skew the constitutional process in the sitting President’s favour. Like the best documentaries, however, it is not a film about historical events so much as it is a film about people. 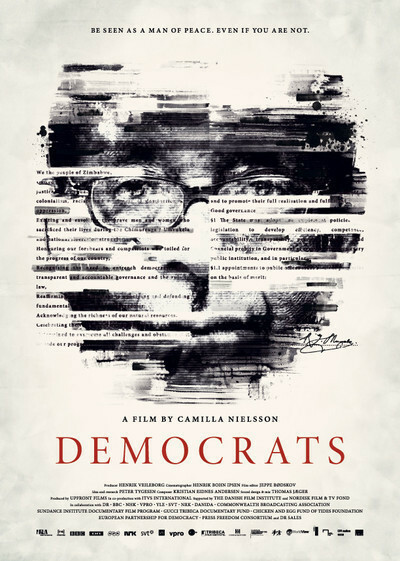 Mangwana and Mwonzora are both fascinating men, and Nielsson spends three years in the company of both of them. The result is something genuinely intimate and insightful. Mwonzora is a studious and careful political operator, who takes great personal risks to ensure that the process is legal. In doing so he faces disrespect, false accusations, and even a temporary arrest. Mangwana is arguably the more fascinating person. He begins as a man of great humour and confidence, breezily and knowingly working within and for a deeply corrupt government. As the process continues, he finds himself accused of working against his own President. The cheerful facade vanishes. Rage and paranoia break in. He visibly – and appropriately – begins to fear for his life. It seems a life-changing experience, and is perfectly captured and observed by the director. Director Camilla Neilsson has assembled her film in a perfectly methodical and illuminating fashion. The narration is sparsely distributed and brief, applied only when it is necessary to follow what is going on. The two sides of the constitution-drafting process feel evenly presented in a matter-of-fact fashion, leaving the viewer to recognise the obvious injustice that is taking place. She has clearly developed immense trust in her subjects, who are open with their opinions and emotions despite the ever-present camera. By the film’s conclusion, the most fascinating element of the film is just how the relationship between these two vastly different men has developed and matured. There is an odd sort of friendship in place, one that’s perhaps a little rueful and bruised, but cuts deep to the human story that makes all documentaries of this nature leap off the screen. This is a film rich in political detail – of both the national and the personal kinds.